"There Will Be Blood" will be attacked with the same ferocity that it presents. This is a movie that left me feeling like I just got punched in the gut. My best advice for viewing it is to just sit back and let it engulf you in its monstrous beauty. The resonant and hypnotic voice of Daniel Day-Lewis helps to draw you in, and his character is a man with such bruising relentlessness that you won't believe it. This is a man who, in the first minutes of the film, falls down a mineshaft and breaks his leg only to get right back up to start again. He is a raging force of brutality that intensifies as the movie progresses through the first three decades of the nineteenth century. After the epic is over, you will feel pummeled, having to take a moment to get your head clear again. It's worth the effort. This is a large departure for director Paul Thomas Anderson who also made "Boogie Nights," "Magnolia," and "Punch-Drunk Love." The movie is very loosely based on the 1927 Upton Sinclair novel "Oil!," but don't go expecting that same muckraking spirit. There's still an attack on society, but something much different is being implied with Anderson's highly original and visionary work. There's something murky and dark lying beneath the American success story, and it's shown in full detail here. As an enthralling American epic, this one intrigues, disturbs, shocks, and provokes with stabs at the worst of corruption of power and exploitation. Sitting resolutely in front of an audience made up of a small rural town, Daniel Plainview (Daniel Day-Lewis) exquisitely states, "Ladies and gentlemen, I am an oilman." His greed in the business begins when a young man named Paul Sunday (Paul Dano from "Little Miss Sunshine") visits him unexpectedly and tells him where oil can be found. He leads Plainview to his father's goat farm, and Plainview easily buys the land from the old man for cheap so he can begin drilling. There is another son, though, Eli Sunday (also Paul Dano), who is identical and is a devout preacher wanting to raise money for his church, the Church of the Third Revelation. This other son puts religion directly in Plainview's path, and when Plainview ignores Eli's wish of a blessing upon the drill, a lifelong feud ignites. Daniel Plainview is a man with no lover, no friends, and no remorse for anything he does. The only piece of family he carries with him is his son, H.W. One day, there's an accident, and the oil well blows over and bursts into flame. Plainview's son is deafened by the blow of the explosion, and he immediately becomes a burden. Plainview ships him off to school, that is, until he realizes a new way to exploit his son. He needs him as a prop, and even when H.W. tries to forgive his father many years later for what he did, Plainview still responds with a vileness that cannot be compared. He does show some sympathy, however, when his supposed half-brother comes to help him in his endeavors. But even then, Plainview discovers a lie and turns on him. "I look at people and see nothing worth liking," he states. "There Will Be Blood" is magnificently bleak, strange, and brilliant. It not only tells the haunting story of an indestructible and soulless man, but through Paul Thomas Anderson, there's huge attention to detail, making for amazing execution in storytelling. It's yet another astonishing look at the barren landscape of Texas, similar to that of "No Country for Old Men," with shacks and derricks dotting the horizon. When an oil well erupts with black smoke billowing from tall flames, there's a certain poetic feel to it. In its style, the movie transcends its own historical context because for a story that takes place in older days, its terrors are relatable to the modern day. And for telling a story with such a time span, the focus is shockingly intimate and breaks the boundaries of the contemporary. In Daniel Plainview, Daniel Day-Lewis provides a horrifying character who is blackly comic. He delivers a powerhouse performance, one that is more than intense, explosive, volcanic, or all of those words combined. It's the performance of the year, and Day-Lewis will certainly win a nomination if not the Oscar. His preparation for the role involved him refusing to leave character even when the camera wasn't rolling. You can't help but wonder why someone would want to dive so deep into a character who's so dark, and yet, it worked damn well. For somebody so revolting, he's endlessly fascinating. He's a dangerous man who's moody and usually drunk, and comes alive with fury, anger, and hatred. And Paul Dano is almost equally frightening as Plainview's sole formidable opponent. To fill the voids of silence within the film, there's the searing musical score by guitarist and composer Johnny Greenwood of Radiohead. On the surface, the music doesn't fit the scene at all, but in the context of the film's style, it's perfect. It builds with a demented tension that rises and falls with the action of the film, and it's like nothing we've ever heard before. The juxtaposition to that is the intermingling of music from Johannes Brahms that, when introduced, signals some of the most key moments of the film, such as the explosive ending. 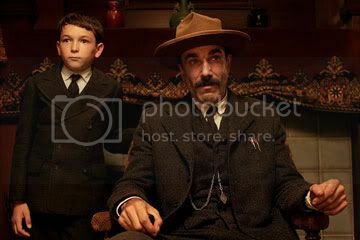 Taking place in a bowling alley in Daniel Plainview's home, the climax is a final confrontation between him and a blackmailing Eli. This last sequence turns into a bloody mess, keeping the promise of the title. Several audience members around me were shaking their heads in what I would guess to be disgust. I would be curious to ask these people, how possibly else would they have liked it to end? After witnessing all that has happened, I couldn't possibly think of a more suitable ending, as terrible as it is. Paul Thomas Anderson is unconcerned with expectations, bashing all Hollywood clichés. "There Will Be Blood" is actually quite the anti-crowd pleaser, and that's what makes it so good.